This autumn/winter has been so fun with fashion and we have explored different styles like blazers, tailored coats and party season dresses. Something every gal needs around this time of year is a reliable pair of black booties that you can slip on with almost any outfit day or night. It can be hard finding a pair that you like, some are plain, some have details, buckles, high heels or flat but choosing can be enjoyable you just have to know where to look! There are some great options (and offers) if you choose to shop online, we want to give you the inspo to go find your perfect pair. You can be bold, play it safe, get some bling going or try a different look like a velvet boot, there is so much variety. 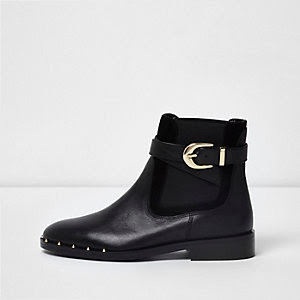 For the gals who mean business, a patent heeled boot is a go-to for creating a well-styled look. You can't go wrong with a bit of everyday glam! Shop here. The simple gold ring detailing on this boot makes them super stylish. They are easy to wear as they have a low block heel and the added detail means they will look smart with jeans, dresses or skirts. They come a little further up the ankle and flare out slightly which can be flattering! Shop here. The metallic heel on these gorgeous boots makes them a little harder to wear regularly but wow they are stunning! The rolled up jeans go perfectly with these, if you prefer to wear boots over heels on a night out these could be a great purchase! Shop here. This studded chelsea boot with the buckle detailing are so easy to wear, they are ideal for gals on the go who run around all day needing something stylish and comfortable. Shop here. 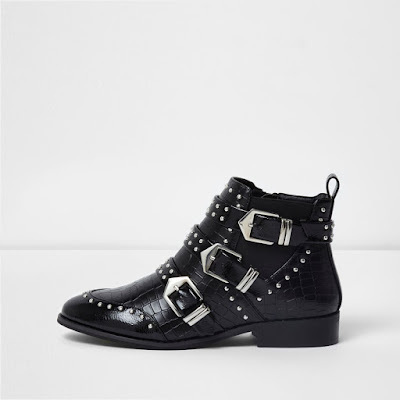 These gorgeous black studded buckle boots are gorgeous and really on trend at the moment. They have a kind of grungey edge so they would clash perfectly with a pretty girly dress and tights. They would also work well with jeans and skirts, tights are optional! Shop here. These black tie block boot are sophisticated and would look beautiful with a knit maxi dress this winter. They are simple but the bow makes them a little different which can be nice for a change! Shop here.